On May 27, shortly after their jubilant, Jah-inspired performance at the Ninth Annual California Roots Music and Arts Festival (“Cali Roots”) – a performance that showcased the band’s spiritual energy, its sensational musicianship, and its unique and uplifting vocal stylings – I had the honor of interviewing Raging Fyah’s lead singer Kumar Bent, bassist Delroy “Pele” Hamilton, and keyboardist Demar Gayle, for roughly twenty minutes. We discussed the band’s backbreaking work ethic, the official video for their song “Happiness” (off of their 2016 Grammy-nominated album “Everlasting”), the new “Coming in Hot” album and the track “Rebel” (the first song released off of the album as a single), marijuana, social media, Rastafari, and several other interesting subjects. What follows is a transcription of the interview, modified only slightly for clarity and space considerations. That was a sensational performance. The crowd loved it. And I just want to congratulate you on it. And also congratulate you because today you’re wrapping up the tour that you’ve been on, the “Marching Orders” tour. How did that tour go? Kumar: It was a great tour; about six shows with The Green and Iya Terra. It’s been great learning new music, you know, from these guys. And getting to know them. Because we’ve been introduced to the U.S. market [only] three years now, touring with the bands on the scene. I thought it was [ironic] the tour was named the “Marching Orders” tour because you guys had just finished up another tour with Rebelution, the “Winter Greens” tour that you did in January and February, which was an even longer tour. So, really, you guys have been “marching” all over the United States for quite some time now. Kumar: Yes. Three years. Three years nonstop. 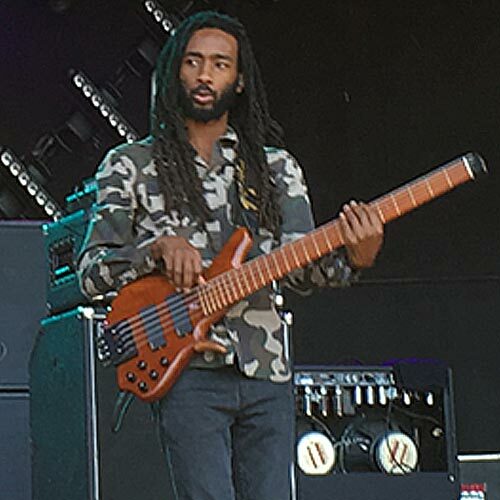 In fact, Dan Sheehan, the co-producer and talent-buyer for Cali Roots, identified Raging Fyah as a band that has been really “grinding it.” Especially in the U.S. market. Would you agree with that assessment? And have you noticed that it’s been paying dividends? Have you noticed that your popularity in the U.S. has been expanding as a result? Kumar: Yes, yes, it has grown. Yes. I’ve noticed too. 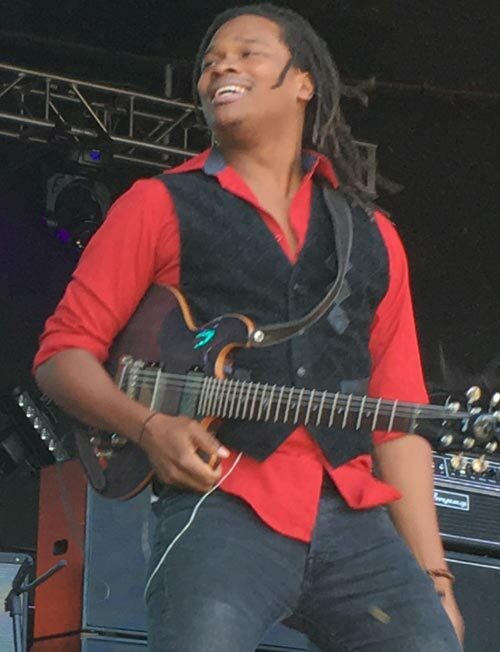 Now, in addition to your touring schedule, Raging Fyah has been very busy in other ways as well. For example, in March, you released an official video for the song “Happiness” off of [your Grammy-nominated album] “Everlasting.” Where was that video shot? Demar Gayle: In Richmond, Virginia. But with [the video for] “Happiness,” I got the feeling the band intentionally kept it [low-key and organic] to get the simple message of the song across. True? Kumar: Yeah. Because the simple things in life are what make us happy really, you know? Kumar: Instead of getting complicated with a video of that nature, we just decided to be free. Now that you are about to release a new album, your fourth studio album, which of course I want to talk to you about next, do you think that this video for “Happiness” will be the last official video [Raging Fyah] will make for the songs off of your “Everlasting” album, or could there still be more? Pele: There could still be more. Demar: There could still be more. Kumar: Because we have other songs off of the album that we haven’t [yet] released videos for; so we keep feeding people with videos from the [Everlasting] album. Please, keep feeding us, because we’re hungry for as much of Raging Fyah as we can get. Demar: Just to mention, the video for “Happiness” was more like a lyric video. The focus was on the lyrics. Yes. Though of course people probably enjoyed watching you [in particular] do cartwheels [on] the video – because I think you’re the one that can be seen doing cartwheels – which is fantastic. (All laughing.) Turning to Raging Fyah’s soon-to-be-released fourth full-length studio album, which reggae fans have been feverishly anticipating, does the album have an actual release date yet? Or, not yet? Kumar: (Wincing and smiling) Not yet. Pele: But we have a title. Can you reveal any of the artists who collaborated or who are featured on your new album? Are you able to release any of that information yet, or, just wait and see? Kumar: You can wait and see, but we’ve been in the studio with some of our good friends. And you’ve been in the studio – I saw pictures of [the band] with the [music] producer Shane Brown of Juke Boxx Productions. Ah, the sound engineer on it? Kumar: No. Not about the album. But, it’s a family. We’re all family, you know? Now [Raging Fyah] recently released this great track you played today, “Rebel,” which DJs and selectors have been [spinning] nonstop since [you dropped the tune back in March]. It’s such an [ultra-]creative, [conscious] song. I know it was [produced] by Llamar “Riff Raff” Brown who [Raging Fyah had such success with on its Grammy-nominated album “Everlasting”]; is “Riff Raff” involved a lot on this new album as well? Raging Fyah: Well, not a lot. But he’s involved as a producer. Because we’re the main producers of this new album with co-productions from Riff Raff and Shane Brown. It’s fitting that “Rebel” is the first track to be released from off of your new album because so much of Raging Fyah’s [discography] tries to deconstruct and get to the root of what does it mean to be a rebel. And also, to me, the song shows that there are many ways to be a rebel in your life. It involves how we interact with people, how we tend to our responsibilities, how we pursue our heart’s desires. We have choices in our life to be a rebel every day. Do you agree? Kumar: Yes. There’s always an opportunity to rebel, you know? Because you’re not going to agree with everything every time. But rebellion doesn’t necessarily mean you go out in the street and burn and crash things. It’s your thought process. And how you treat yourself. You know: your morals, your values. Kumar: Yeah, there’s an intention. Pele: Rebel on a mission. A VP Records press release observed that your new track “Rebel” has “a new subtle, alternative instrumentation”; can you explain or describe a bit how this is so? Kumar: I think that synth sound in the song – it’s not rebellious. It’s very subtle. It’s very easy on your ears. True; it’s a bit more up-tempo, melodious. 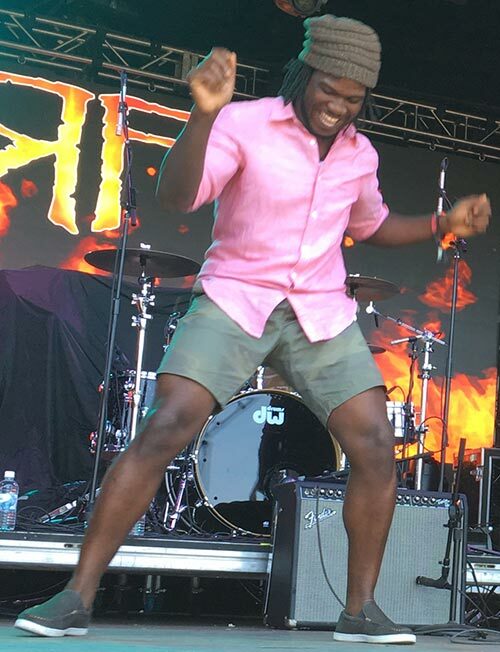 Raging Fyah: Yeah. It’s melodious. You know, you could listen to what we have to say and enjoy it too. It’s like a Childish Gambino kinda thing; we’re making it nice to rebel. Now about the official video for “Rebel,” and also, way before that, for the video that you made for your popular cover of Dennis Brown’s “Milk and Honey”: Kumar, I know you’re friends with Yaadcore [a well-known Jamaican DJ associated with reggae artist Protoje] from high school; but why did you decide to feature him and his young son, Streme, in [both of] those videos? Kumar: I think, you know, with Streme, I wish I had had dreadlocks when I was a kid. Personally. I think that was the driving force. I wanted to represent what a younger – what each of [our] younger selves would have been. A younger version of a Rastafari from youth? Kumar: Yeah. A younger cultural youth. I think the easiest way to represent that was to have a rebel, a Rasta youth, who is growing up in a different household, with a different frame of mind. And Yaadcore is my good friend. So at the end of the day it was easy to get [him and] Streme [involved]. And Yaadcore is a big-time supporter of conscious roots reggae – like Raging Fyah music? Pele: Yeah man. Yeah man. Kumar: Very supportive. We’re one family. I want to ask you a few questions about marijuana. 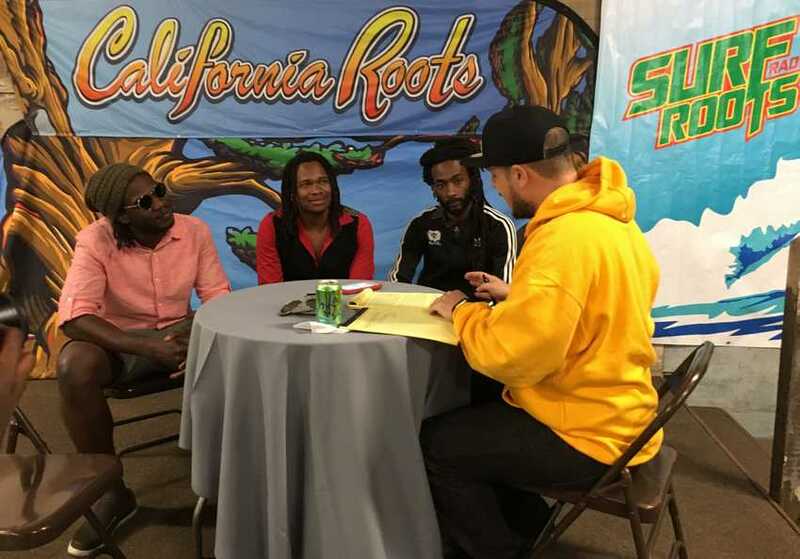 This is an important topic that we talked about the last time I interviewed Raging Fyah; you guys had just launched your [own personalized indica-dominant] strain [of marijuana], “Everlasting Kush,” making a lot of news [in both Jamaica and the United States]. Are you able to sell Everlasting Kush outside of Colorado yet? Kumar: No, not to our knowledge, not as yet. And have you been able to realize any profit from it? Or has it been more useful in terms of branding and promotion? – but grows and sells weed? Are you frustrated with the slow pace of legalization in the United States? This is holding you back from making more a profit; many marijuana investors seem frustrated. Raging Fyah: Well, we are not really marijuana investors just yet. The daily frustration lies with the people who invest all their earnings into making these companies work. But, for us, it’s been great in terms of realizing that we can actually smoke weed legally in the U.S. (laughing). You know, it wasn’t like this three years ago. Two years ago. – Jamaica. Will that happen any time soon? Kumar: Once the papers come through, we are ready. 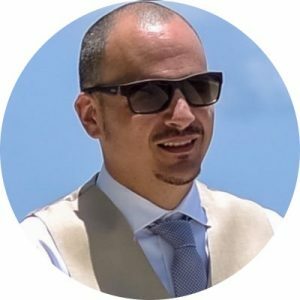 Has the Jamaican government become more open to realizing the full benefits [of marijuana legalization]? Kumar: They are becoming more open. Raging Fyah does an excellent job managing its social media. By this, I mean [the band] is very responsive and genuine in your interactions with its fans. You don’t over-promote yourselves and somehow manage to stay “humble,” even on social media – which is really tough to do – respect for that! Can you say, for all of your fans who interact with you, who from the band is at the controls for Twitter and Facebook, or do you share social media responsibilities? (All laughing. Pele and Demar point at Kumar). Pele: Kumar is the main person. Kumar: We all do, but I post most of the time. Pele: I say Peter Tosh. – a record label and management company in Ottawa, Canada; “Big Daddy” asked: “What country has been the most responsive to Raging Fyah music? 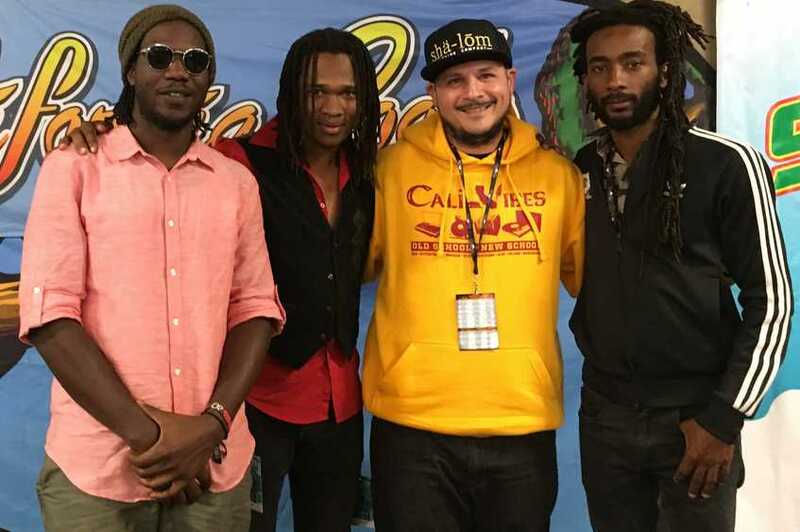 [Raging Fyah] has a huge following worldwide. Another place where anyone can see this is in Africa. They adore you there. The idea of Raging Fyah singing your song “Africa” from off of the “Destiny” album actually in Africa [brings] goosebumps. I mean (singing) “what if our destiny is that we’ll all be free, when we all meet at our homeland [in Africa]”? Kumar, you were recently on the radio with “Mister Parties” [a radio DJ] in Kampala, Uganda, on 97.7, and he was basically pleading for Raging Fyah to come to Africa. 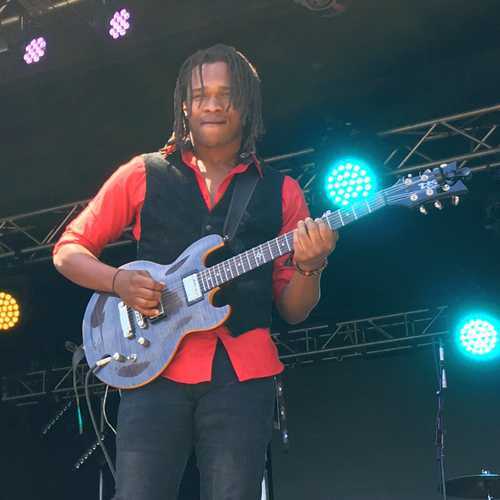 In fact, he just rated [Raging Fyah’s new song] “Rebel” the number one track on his “ReggaeHitsVille Top 10.” Are there any obstacles that prevent you from performing in Africa? [You’re] waiting for it to be setup. Because you would jump to go perform there if you could? Before you signed [a multi-album deal] with VP Records, you produced your own music initially. And I know that one of the big reasons you signed with them was [for] them to help you grow your market [share] on the West Coast [of the United States]. You must be satisfied because it seems to be working as you said – they’ve done that. But: do you think that despite all the success you’ve had with VP, that someday you may go back to producing your own music? Or are the benefits of being with a big company like VP too [overwhelming]? So through Raging Fyah, the band is now able to provide more of that kind of knowledge to the students coming through? Now I want to end by asking a few questions about Rastafari because this is such a [heavy] focus on all of your albums. Would you agree that that is something that factors very heavily in your music? In a 2015 book called “The Half That’s Never Been Told (The Real-Life Reggae Adventures of Dr. Dread)” by Gary Himelfarb, a.k.a. “Dr. Dread,” the founder of “RAS Records,” which has produced a lot of [quality] reggae music, he [wrote] he has a very close relationship with Haile Selassie I. He [wrote] that he actually once saw H.I.M., or had a vision of H.I.M., walking down Trafalgar Road, which I believe is in Kingston. And he [wrote] that no [one] can say that he doesn’t have a relationship with Haile Selassie I just because he’s a white man and doesn’t have dreadlocks. Nobody! And, in fact, he [writes] that he does have a relationship with His Majesty, and gives praises [to him] every day. Do you accept that? Can white men and white women have a relationship with Haile Selassie I? – about whether or not white people can have a relationship with Haile Selassie I? Isn’t there an analogy to be made to the popular debate about white people who are appropriating reggae music and making money off of it? If you come at it with a pure heart, just like if you come to Rastafari with a pure heart and intention, and you believe in it, and you show respect for the culture, and to the roots of it, isn’t [that what counts]? Cut all the fussing and fighting out?